Many thanks go out today to Disney World Moms Panelist Kathie F., who has kindly answered a few interview questions about how to make dining vegetarian in Disney a thoroughly fulfilling experience! Stay tuned after this to hear more from Kathie as she continues to contribute her tips and experience in upcoming Disney Food Blog articles! My questions for Kathie are in bold! A. I don’t know if I have one; since there are so many options at so many restaurants I like to try and mix it up every visit! 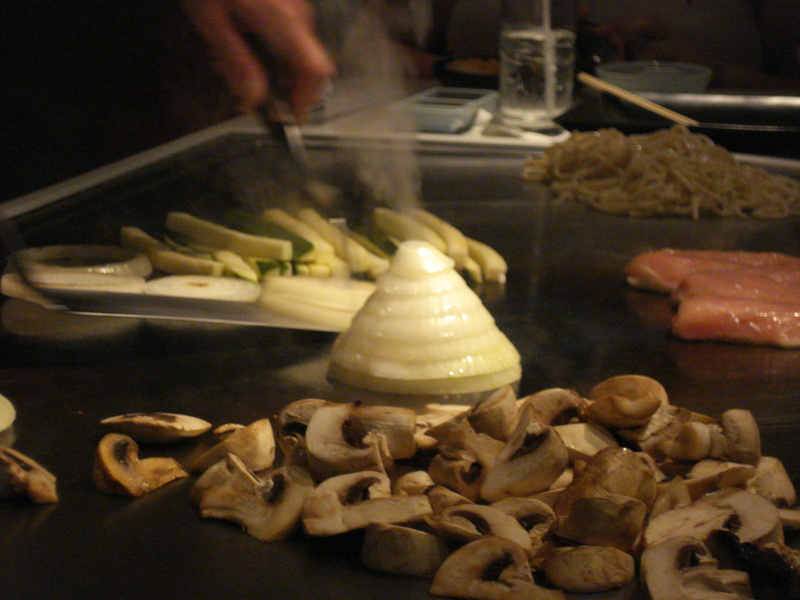 One of my stand-by restaurants is Teppan Edo. Our family loves the show that accompanies the food, and I love the veggies and noodles served there! As you’ll see from some of my other answers — I don’t shy away from any Disney restaurant no matter what the printed menu says! If you’re planning on dining vegetarian at WDW, just expect the unexpected. Don’t expect to be stuck with a salad at each and every meal! You’ll have plenty of variety! Q. How far in advance do you recommend contacting Disney if you’re going to be visiting with a special dietary need? Do you suggest contacting the Disney Special Diets line directly, or should guests call WDW-DINE and note the dietary request? Do you feel it’s necessary to contact Disney as a vegetarian, or are there enough options on the menus alone? A. Honestly? I don’t even notify WDW dining anymore! Since I travel so often to Walt Disney World, I’ve learned that I simply don’t need to! 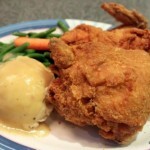 WDW is THE easiest vacation spot for me to visit and dine well! Our family travels quite often, from short weekend trips around North and South Carolina, to beach vacations in the summer, to travel to New England (we’re Vermonters originally! ), and I always worry about where and when I’ll have a decent meal. For those trips, I won’t even leave the house without throwing a granola bar or snack in my purse! Now, I would suggest notifying Disney Dining in advance via the Special Diets line if you have a food allergy, health requirement, or are a vegan. Disney is awesome at handling these requests as well, but they do require a little more preparation and notice than a vegetarian diet. Q. Is it easier to dine with a specialty request like this at a counter service location or a table service location? Do you have suggestions for counter service and table service restaurants that work well with specialty requests? A. I know this might be hard to believe, but I’ve NEVER had an issue dining as a vegetarian at any counter-service or table-service restaurant at Walt Disney World. In fact just last week I dined at the Yak & Yeti counter service, which has a printed menu that contains ZERO vegetarian items. But, I wasn’t worried – I simply got in line to order with the rest of my family and approached the cast member. She didn’t even bat an eye when I asked if she had any vegetarian options for me! She offered a couple of options and I chose the Sweet & Sour vegetables. It was a huge portion that was hot and delicious. The counter service cast members were very efficient and I waited to be served about 30 seconds longer than the carnivores in my family! Another table service restaurant which is an incredible dining experience for vegetarians is ‘Ohana. Typically a feast of steak, chicken, pork and shrimp, the vegetarian plate was overflowing with tempura broccoli & asparagus, fried BBQ tofu, steamed rice and lots of veggies. Seriously, this platter served ONE person! Of course, if you have a mix of picky eaters and special diets in your group, you really can’t go wrong with a buffet like Chef Mickey’s or the Crystal Palace. Just ask your server what your options are as a vegetarian. Often, they will personally show you the options that are meat-free! Q. What have you learned in your experience that you “wish you’d known at the beginning” when it comes to making specialty requests at Disney restaurants? A. Since I’m a fairly recent vegetarian (its only been about a year and a half for me…), I had visited Walt Disney World many times before changing my eating choices. My first few trips had me worried that I’d be eating salads or pizza for my entire vacation! But, I quickly learned that there is something for me at every restaurant — even if I don’t see it on the menu. 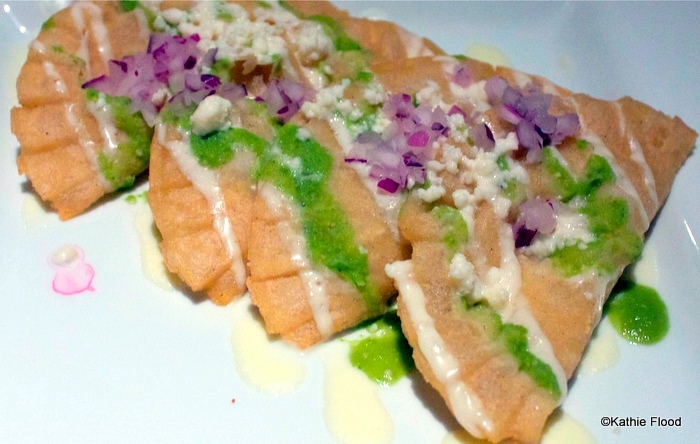 A recent trip to La Hacienda de San Angel was one of those experiences; a quick look at the menu shows very few vegetarian options beyond a Spinach Salad. But, knowing my past experiences at Disney restaurants, I knew to just ask. And, I was rewarded with 3 additional options: Cheese Empanadas, Veggie Enchiladas or Veggie Tacos. I chose to try the empanadas and wasn’t disappointed! In fact, I think my meal was the best value for the money! Q. What are your top tips for those dining vegetarian WDW? A. My #1 tip: Don’t be afraid to try any restaurant or dinner show! Some of my best meals have been at surprising (to me) locations! For example, Hoop Dee Doo Musical Revue is a fun, hilarious dinner show that’s best known for its pork and beans, ribs and fried chicken. Not exactly a vegetarian paradise- right? WRONG! With just one quick word to the cast member server, a chef came out to visit me. He offered me two options for dinner: A grilled vegetable platter or a pasta dish. The grilled vegetable platter was incredible! It was a plate overflowing with zucchini, potatoes, seasonal veggies AND a portabello mushroom bigger than my fist! 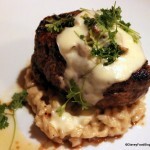 For a location where carnivores rule, I felt like I had the best meal in the house! Q. Are there resources in Disney World for those dining vegetarian as to which restaurants and locations can best accommodate them? A. Well, of course you can always stop by www.DisneyWorldMoms.com and ask me a question about healthy or vegetarian dining at Walt Disney World! I always LOVE to answer these questions and seek them out! Any time I can talk about Food AND Disney World, I’m one happy lady! But, if you’re at Walt Disney World and aren’t sure where to dine, just stop by the restaurant and ask a Cast Member. They are always willing to help and make suggestions. For more complex food allergies and requirements, the managers of counter service restaurants can help you out with meal ingredients, and a chef will be happy to talk to you at any sit-down restaurant! Q. What’s the best vegetarian meal you’ve been served in Disney World? A. Now that’s a hard- I don’t know if I can pick just one! 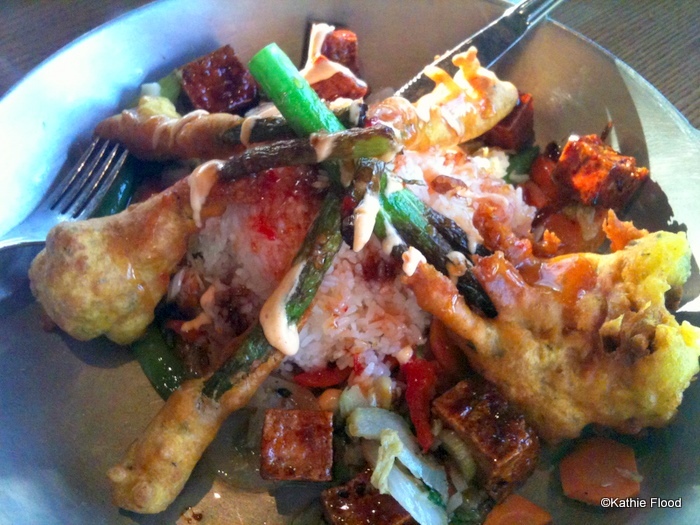 I think I’d have to say its an even tie: between a vegetarian Bento Box at Flying Fish (Hey, what can I say? It contained pea risotto! YUM) and the California Grill‘s roasted beet and goat cheese salad. 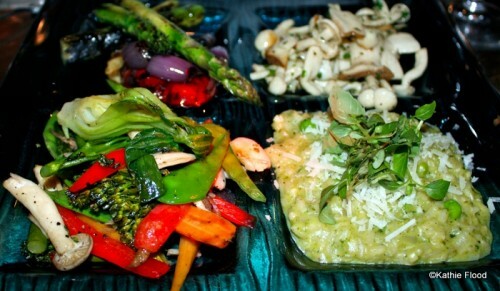 Both of these restaurants are tops for vegetarian offerings! Q. What are your favorite vegetarian snacks in Disney World? A. Oh, this is an easy one — since everything at the new Karmell Kuche in the German Pavilion at Epcot is vegetarian! Just kidding — well, sort of! On a serious, and more healthy note, our family’s favorite go-to snack is the Baked Potato at the snack stand in Liberty Square. The potatoes are a quick, healthy option – unless of course you top it with the butter, sour cream and cheese that’s provided along with it! Just try to resist, I dare you! FYI — you can also find Kathie over on her blog, What Now?!?!?. For some of our readers’ favorite restaurants for vegetarian items in Disney World, check out our Best Restaurants for Vegetarians in Disney post. 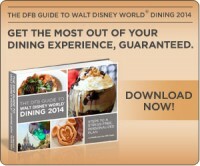 We’ve got TONS of Disney World Dining Tips in our big, bold, 450-page DFB Guide to Walt Disney World® Dining 2014 — and the guide is your ticket to planning your best Disney trip yet! 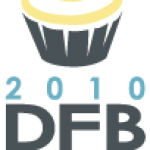 The DFB Guide to Walt Disney World® Dining 2014 is full of tips and planning tools developed by Disney World experts over 20+ years of visits. We’ve done the research for you, so you’ll know just which spots will uniquely suit your family’s needs! YUM! Great tips and advice; thanks so much! My herba-free-range-arian son will definitely benefit from this. Those photos are amazing. As a life long Disney fan and vegetarian for almost 15 years, I have never once had to sacrifice a good meal at Disney. Like Kathie mentions, every table and counter service venue will have a vegetarian option either on the menu or specially prepared if you ask. Great column, Kathie! My experiences as a vegan in WDW are similar to yours. In general, not one server or chef bats an eye when I say the word “vegan,” and in every instance – except at the Turf Club at Saratoga Springs – the chef offered to adapt a recipe or cook something entirely off the menu if I wanted. – Sanaa at Kidani has some wonderful vegan options – our server even had a full, printed vegan menu to give me last time I was there. – Tusker House also was very nice. The chef gave me a “guided tour” of the entire buffet, pointing out which items were already vegan and which ones he could make for me by substituting vegetable stock. Wow Kathie continues to amaze me. Great interview and great answers. You can bet I’ll be referring guests to this Q&A often! I made my first trip to Disneyland as a vegetarian just this past weekend, and I gotta say I was pleasantly surprised at all the wonderful vegetarian options they had there as well! We even had dinner one night at Napa Rose and they created a vegetarian version of their tasting menu (The Vintner’s Table) for me! Being a fine dining chef, I usually hate to ask for vegetarian options, since I know how difficult they can be to accommodate, especially if you don’t have any advance notice. After the first couple times at Disneyland, though, I had no problem asking whatsoever. They were always gracious and seem very well prepared for almost any kind of dietary restriction, without sacrificing the quality of the food. I HATE when someone makes a dish “vegetarian” simply by leaving the meat out, it smacks of laziness and uncreativity. That was never a problem at DL, and I never felt deprived or like I had to order a cheeseburger, hold the burger. Thanks for the information Kathy, it really is great to know what options are available. I’ve seen several reviews of the Bento box and not a single person has been disappointed once. Thanks guys! I really can’t explain how easy it is to dine at WDW. When every instance of dining at my hometown restaurants begins with “But what will Mom eat?” some of the fun of being a “foodie” disappears! 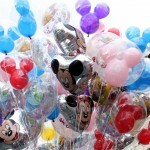 Not so at Disney – and that really is a relief! How did I miss the baked potato at the snack stand in Liberty Square? Is that year round? I can’t believe I didn’t know about it. I just finished my college program at Disney World (I worked in Fantasyland!). I’ve been vegetarian since birth, and it was so easy for me to find food to eat. My parents (also vegetarians) came to visit me in December. We ate at Sanaa, Portobello’s, the quick service restaurants in Mexico and Morocco, Via Napoli, Rose & Crown, and 1900 Park Fare. My favorite was 1900 Park Fare, my parents’ was Sanaa. Can I go back now? This is great! I’ve been vegetarian for 20 years and have Disneyland has really come a long way with their options. I didn’t have any problems at WDW either except once back in ’99 during the extra magic nights (I don’t think it was EMH then, can’t recall) they didn’t have anything open but the turkey leg place in T-land. Other than that, it’s been really easy and enjoyable. I can’t wait to go back soon and try some of the offerings at the sit-down places. Another long-time vegetarian who’s been pleased with the ever-increasing variety and quality the food at Walt Disney World and Disneyland. It’s a pleasure to eat at restaurants that know how to prepare tofu well. A favorite of mine – The Hollywood Brown Derby Noodle bowl with coconut tofu. Yum! I’ve not yet tried the Flying Fish, and all I hear are good things – so the Bento Box will be part of my next trip. Thanks! re: the part where the chef came out and said “pasta dish or veggie dish” – this is the most bland vanilla answer an uncreative chef can give – basically we have pasta and we have veggies in the back, which can i cook up with butter and give to you, it may have turned out good but it’s uncreative and boring. – I don’t understand why every menu cant have 2 items on it for vegetarians considering the number of them there are in the world – especially at disney. the seared, marinated mango tofu at the scifi drive in (hollywood studios) is a do not miss! I’m a vegetarian and I go to Disneyland. Sometimes, I eat things when I’m there. the same grill as the meat skewers? Boo! 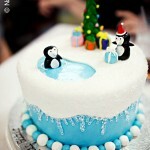 I can’t eat it after all! If you cook a vegetarian meal on the same grill as meat, it instantly becomes non-vegetarian. I was sad that I could not enjoy the tasty-looking veggie skewer due to meat juices. If only the Bengal Barbecue would reserve one small part of the grill for the vegetable skewers, it would make Disneyland’s vegetarian guests much, much happier. Does anybody knows if they have a Veggie hot-dog at Casey’s Corner?? That was always a part of my Disney trip and I hope it could be part of the next one as well!